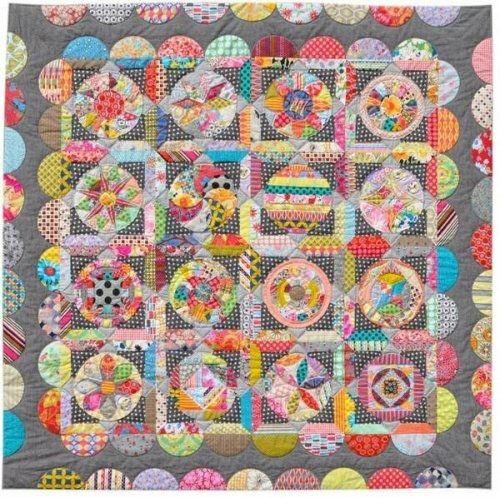 We’re excited to finally bring you Jen Kingwell’s Circle Game quilt as a monthly program! We’re offering this 73” square quilt in 2 colorways. The first option will follow Jen’s original color plan and feature a great dot fabric for the block surround and a dark grey for the outer border along with lots and lots of fun, vibrant prints for the blocks. The second option will feature classic 1800s prints similar to those shown below for the blocks, a great tonal tan dot from Laundry Basket and a tonal floral tan for the outer border. You’ll need the pattern if you don’t already have it. Order it here. This is a 10 month program. In month 1, you’ll receive all the fabric for the block surrounds and fabric to make 2 blocks. In months 2-8 you’ll receive fabric for more blocks. 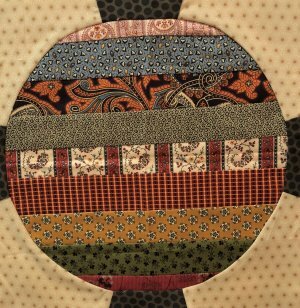 In month 9, you’ll receive the outer border fabric and fabrics for the half-circles and in month 10, you’ll receive more half-circle fabrics and binding. Month 1 is $27.95; Months 2-8 are $9.95 each and Months 9 is $36.95 and month 10 is $16.95. The first month ships in early September, 2018. Remember, we’re now offering consolidated shipping of BOM programs. Starting with August, 2018 BOM shipments, we're offering a way for you to save on shipping! If you belong to more than one of our blocks of the month, you can opt for a single BOM shipment at the end of each month. To keep the process smooth on our end, we'll charge your card for the fabric kits as they become available throughout the month. Then, around the 28th of each month, we'll assemble all of that month's kits into a single package and send them to you as economically as possible, charging you a single shipping amount at that time. 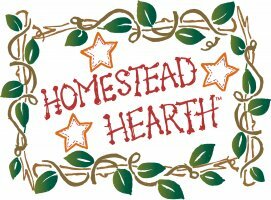 If you want to take advantage of this program, just email us at customerservice@homesteadhearth.com with a list of your current BOMS and we'll get you set up starting with August shipments.